Many large proteins combine to form a signaling platform that orchestrates many varied types of inflammation. Irregularities in any of the proteins of this complex structure can produce devastating diseases, including cancer and autoimmune, metabolic and brain diseases. Inflammation can be caused by toxins, trauma and many types of microbes. Particles related to damage, toxins and microbes trigger pattern recognition receptors. Some of these respond by combining with many other molecules to produce these disc like machines that become a platform for signals related to inflammation. The inflammasomes are distinct in response to different triggers, such as one type for asbestos and others for particular microbes. They then direct and coordinate many cellular interactions and responses. The inflammasome is a very large mechanism with many proteins attached in unusual structural shapes. It is built in a variety of blood cells that are first produced in bone marrow as part of the immune system’s reaction to microbes. Inflammasomes are activated by multiple different recognition receptors, which determine its structure and function. For example, a piece of microbe DNA will trigger one type and an toxin molecule will trigger a different one. One of its critical tasks is producing two vital cytokines interleukin 1β and IL-18 that have dramatic effects on many immune cells. Some pattern receptors, such as NLRP1 combine together into a larger structure that then triggers the vital enzyme capase-1. The vital molecule caspase 1 then triggers interferons. 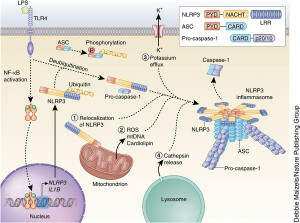 After the first inflammasome for NLPR1 was discovered, others were found that have different structures and properties. Most recently the pyrin version was found, called AIM2, which is triggered from double stranded DNA. 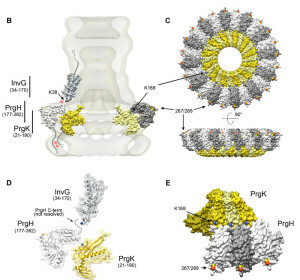 This one uses the adaptor molecule ASC that behaves like a prion in growing large structures. ASC is a short name for a long complex title – Inflammasome adaptor protein Apoptosis-associated speck-like protein containing CARD (ASC). 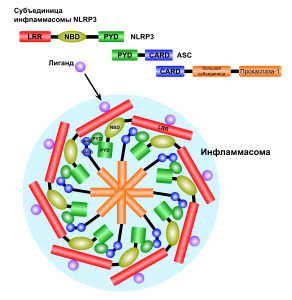 All of this means that there is a region of the protein that attracts other proteins called CARD and that this molecule is an important connector to the inflammasome structure and some other associated molecules. 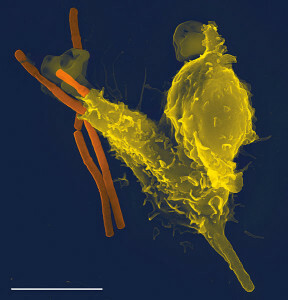 The inflammasome is one of several structures that initiate and coordinates immune activity. Another type is called the apoptosome. Apoptosis is a type of programmed cell destruction, without any inflammation. The inflammasome always starts inflammation. All inflammasome structures are trying to produce caspase 1 enzyme that triggers important actions. But, producing caspase 1 is complex, as well. Several precursor molecules bind to regions on the growing inflammasome including the adaptor proteins. Subunits are cut of the precursor molecule for caspase and these subunits are combined together into a caspase 1. This powerful enzyme cuts precursor molecules of several of the powerful interferon cytokines. One of them activates natural killer cells which slices yet another interferon IL-33. Caspase has other actions including making holes in cells and breaking up DNA that will serve as damage signals for more stimulation of inflammation. In this process, metabolism is shifted into making lipids and suppressing the enzymes that are involved in the glycolytic pathways. There are many other signals including cytokines that are involved in tissue repair. Also very specific cytokines are triggered for specific viruses and bacteria involved. 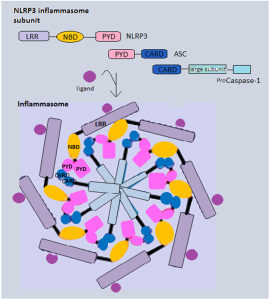 Inflammasomes come in many varieties triggered by the particular PPRs. It starts with the adaptor protein called ASC, which has a region to recruit caspase enzymes ((CARD or caspase recruitment domain). It also has a region related to pyroptotic processes (PYD), that is programmed cell suicide triggering inflammation from the pieces. ASC forms a connection between the triggering receptors and caspase 1. This molecule grows by combining with other similar molecules. Caspase is a protein-cutting (protease) enzyme that triggers pathways. These pathways stimulate the powerful cytokines interleukin-1β (IL-1β) and IL-18, which produce the special pyroptic type of cell death. PRRs first activate enzymes called the caspases that trigger many cytokine signals. These signals kill cells through a process called pyroptotic cell death, which is a programmed cell death that very strongly causes inflammation. In fact, it is geared to greatly amplify the inflammation signals. The exact opposite of apoptosis programmed cell death, where a cell will take itself apart methodically without any inflammation responses. This occurs when material is gradually taken apart of cut up to be used again. While the signals that stimulate inflammasomes are well known, structures of inflammasomes are extremely complex and barely understood. One type is in the form of a wheel or disc with a dozen spokes that have functions. 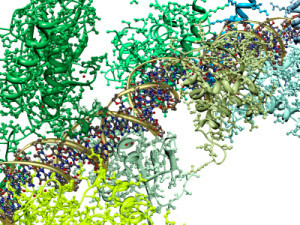 Large molecules combining together build this disc from specific domains such as NOD. They have a hinge that allows 90 degrees of rotation. A different structure is built by AIM2. This one has sections of molecules that combine with DNA that is picked up. A linker molecule allows sections to swing around the DNA core so that they can attach to other molecules making it larger. Once one of these structures is built, receptor sections attach to the adaptor molecule ASC and a molecule that can be cut to become caspase 1. ASC combines into filaments and then with many other ASC molecules (oligomerization) to form a large structure called the ASC speck. These specks can exist inside the cell or can be released to the extracellular space. It attracts many molecules that turn into caspase 1. This large structure amplifies the signals, such as many cytokines. Two things they do is release cytokines IL-1β and IL-18, and stimulate pyroptosis (destruction of cells to promote more signaling and more inflammation). Pyroptosis produces more inflammation by caspase 4 and 5 killing cells. It looks different than programmed cell death—apoptosis. Apoptosis is quite remarkable in that a cell is taken apart organelle by organelle without stimulating inflammation. The molecules are recycled. Pyroptosis is different and produces swelling in the cell, then breakup and release of the content as DAMPs to trigger pattern recognition receptors PRRs. Recently, a protein gasdermine D was found to be necessary for pyroptosis. Caspases cut this protein and a fragment becomes the trigger for pyroptosis. There area several mechanisms at work. 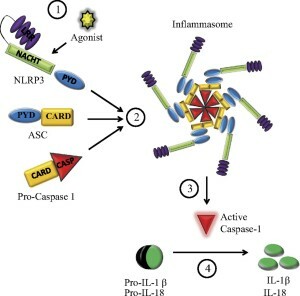 Caspase 1 is the enzyme that cuts a larger molecule producing the cytokines IL-1β and IL-18. These are vital cytokines for triggering inflammation and also regulate other immune processes. They are unusual in that that they don’t come through the ordinary endoplasmic reticulum and Golgi production of proteins. It is not yet clear where they come from. There is a vast amount of regulation of the signaling that goes on from inflammasomes. These include influencing genetic networks, networks of messenger RNA processing and tags on proteins. Also receptors, ASC adaptors, and caspase enzymes are all regulated by many different signals. A large variety of different complex proteins regulate inflammasome signaling. They target caspases, the ASC adaptor regions, and the many receptors already discussed such as the many NLRPs and AIM2. Just as each type of microbe triggers variations of the structures of inflammasomes, many variations exist in pathways that regulate them. One well-known regulation mechanism involves tags on proteins after they are produced. These include phosphorus and ubiquitin tags that control the action of receptors and the ASC mechanisms. Previous posts have described how cells in the fight against microbes use these various tags and how microbes are able to counter with other tags that undermine the cell’s regulatory mechanisms. Tags are placed in several places on the adaptor molecule ASC. These tags are necessary to stimulate caspase 1 into action. Interferons activate immune cells and stimulate inflammation activity against microbes. 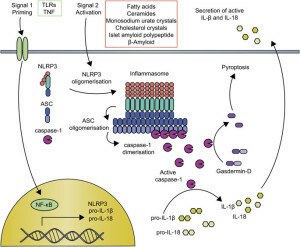 Type 1 and II interferons regulate the signals on the inflammasome. 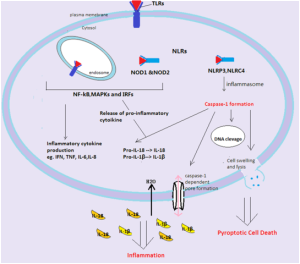 There are many variations in the pathways that stimulate and inhibit these interferon actions at the inflammasome. They can increase signals and inhibit them based on the back and forth signaling from the microbes and the cell. An extreme form of inflammation is called pyroptosis, which is a unique form of programmed cell death. It is designed to greatly accelerate immune responses. 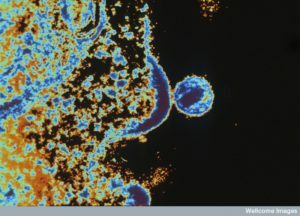 With intracellular dangerous microbes inside of immune cells, danger signals are picked up by the immune cells themselves. They trigger intracellular cytokines that cause the cell to swell, then break up and die. This explosion of a cell releases all kinds of signals for other inflammatory processes and increases the signaling for inflammation. All of the released material becomes increased signaling for amplifying inflammation. Other cells are attracted to the process. This is an extreme measure that is to be used for rapid removal of viruses and bacteria that have found living niches inside of cells. This type of inflammation is radical and is not as coordinated as others and therefore inflammation is set up for a longer duration than would normally occur in response to a microbe. Therefore, damage can be done to tissues. Some situations where this occurs is salmonella inside of macrophages and HIV in T cells. Unlike apoptosis or programmed cell death, this process deliberately leaves many DAMPs to further trigger inflammation. Caspases are necessary for this trigger. Five different receptor proteins assemble inflammasomes. These receptors have been discussed in the post on pattern recognition receptors—NOD (nucleotide binding oligomerization domain), NLR (leucine rich repeat containing protein), AIM2 (absent in melanoma 2), and pyrin. NLRs come in varieties NLRP 1, 3, and 4. Along with these now well-established triggers, others include caspase 11, 4 and 5. There are many others now being discovered with less data including RIG and IFI16 discussed in a previous post. 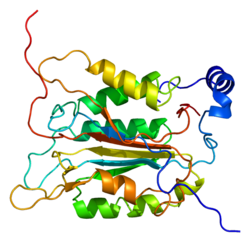 This protein contains domains that include PYD, NOD, LLR, FIIND and CARD, all related to producing inflammasomes. There are multiple variations of the gene that makes this protein and they are related to particular microbes such as Bacillus anthracis. These different regions of the one molecule trigger many complex cellular pathways through a variety of kinase enzymes. Eventually the vital caspase 1 is triggered. There are many loops of stimulation and inhibition in these very complex cascades. In the case of anthrax, the microbe produces molecules that inhibit and interfere with the process. A very large amount of different stimuli trigger this molecule including uric acid, silica, asbestos and many other molecules. This receptor is triggered by ATP and toxins that form pores in cells, pieces of DNA and RNA, and multiple microbes including viruses, bacteria, fungus and protozoa. There are many signals that need to take place to trigger the inflammasome. Extensive research has not discovered a simple mechanism, but rather a wide range of different interacting mechanisms. Factors include reactive oxygen molecules, ineffective mitochondria and lysosomes, calcium levels, and potassium levels (from holes in the membrane). The most recent research finds potassium levels as a final common pathway. One kinase enzyme (NEK7) was recently found to be a critical switch determining the type of inflammasome that is built. This receptor responds to flagella from microbes. It also responds to molecules from microbe secretory systems (type 3 – T3SS). Secretory systems are complex machines that are like syringes and inject signals and toxins from microbes into other cells. There are multiple other receptors that are needed in the cascades that are produced by the first stimulus. Some of these are different parts of the secretory system such as the needle, the rod and the microbe’s flagella. 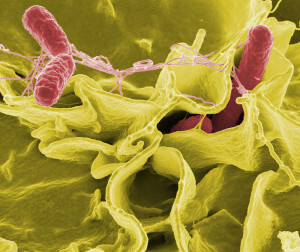 Salmonella is one microbe that triggers this system. This molecule has different regions with various properties. Many microbes including the toxin B of C. difficile, C. botulinum C3 toxin and others trigger it. Not much is yet known about these inflammasomes and in C. diff, the main inflammasome is triggered by NLRP3. One vital section of pyrin is called B30.2 and this found in a hundred human immune molecules. It appears to increase the interactions between immune molecules. Pyrin is involved in the process whereby cells eliminate debris called autophagy. For this function it interacts with numerous other receptors including NLRP 1, 3 and caspase 1. B30.2 appears to identify the particle involved. It is a regulator of other signals. A molecule made of lipid and sugar from Gram-negative bacterial cell wall, LPS (or lipopolysaccharide), triggers caspase 4, 5 and 11. They produce different kinds of pyroptosis. 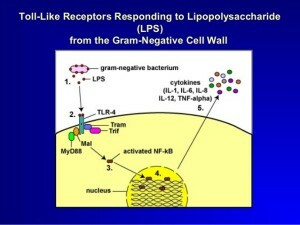 It also triggers NLRP3 inflammasome as well. LPS directly binds to the caspases rather than stimulating an intermediary receptor and signal. Caspases combine into larger molecules. Another new development is an inflammasome from receptor NLRP6 and the interferon IL-18 related to colitis and cancers. 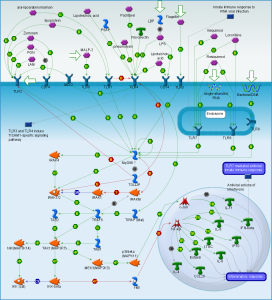 This signaling through many pathways regulates the use of many of the cytokines. See the post on gut microbe signaling for more details. These processes produce many very complex interferons by regulating Goblet cells in the gut. Complex pathways produce multiple interferons—IFN types I (fifteen different types) and III (four types). These are vital to responses to microbes. A previous post described adaptor molecules for the production of immune responses, including IFI16 and STING. One example is when IFI16 recognizes HIV DNA triggering death of CD4+T cells. This then produced AIDS. This process occurs through caspase 1 that kills the cells. Another very complex set of signals is found in innate immunity responding to viruses, bacteria, damaged tissue, and toxins. Through signals, large multi protein machines are formed as platforms for elaborate signaling for unique types of inflammation. Many different inflammasomes are triggered from specialized receptors for the almost infinite number of foreign particles that humans are exposed to. 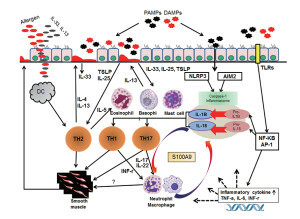 Signals trigger receptors that create large inflammasome platforms for further signaling. Special kinds of inflammation are just being discovered with many unique forms of inflammasomes. This entry was posted in Blog, Cellular Intelligence, Microbes and tagged Pattern receptors trigger inflammasomes, Different Inflammasomes triggered by toxins and microbes, Pyroptosis cell death triggering inflammation. Bookmark the permalink. I just wanted to say that I like the use of the word “responds” rather than the word “reacts” in describing not just the intelligent behavioral aspects of microbes but of molecules as well, in that they are not just being forcefully reacted to, but are being meaningfully responded to in the bargain. Molecules that can effectively produce meaningful communicative signals are not commonly discussed in scientific literature.